So remember that post about tempeh? Say hello your newest friend. 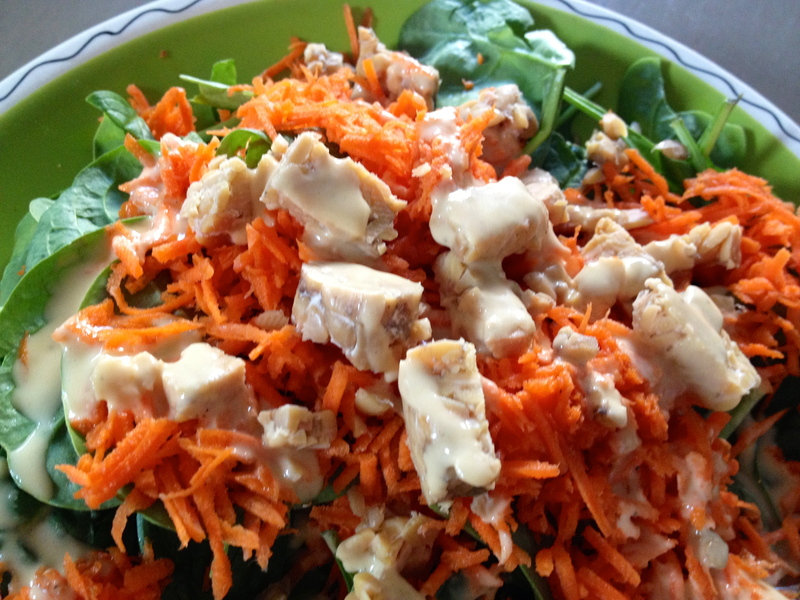 Here is a fast and simple salad to add to your rotation. Thought for sure that the my-foodie-call kids would balk at the miso dressing. But surprisingly, things were a-okay. A fast fix. Seriously. I was pool-side for two hours before whipping this up. 2. 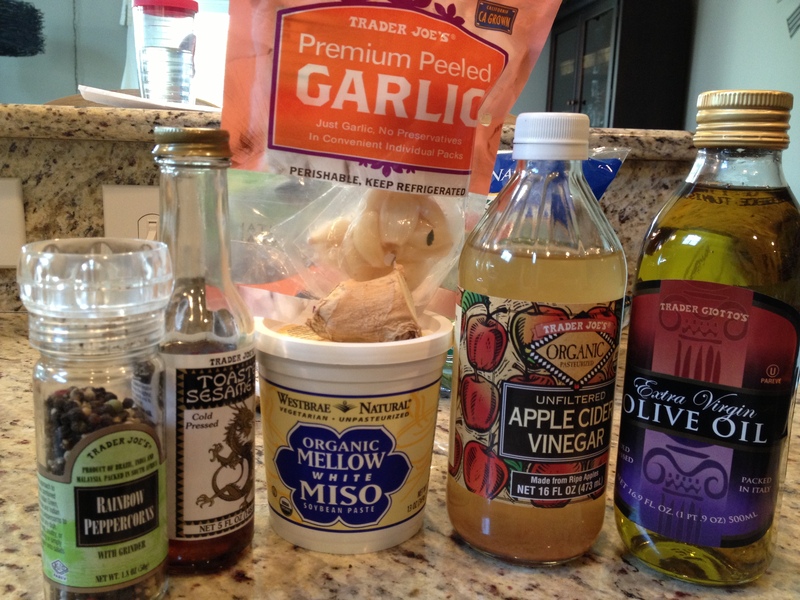 For your dressing: Mix together the first 7 ingredients blending well. 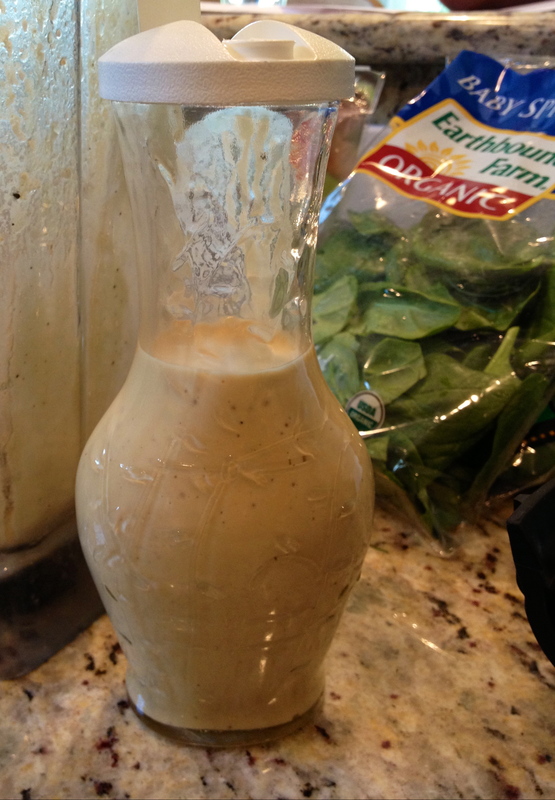 Your best bet is to use a blender (or Vitamix), but if you have mad skills, go ahead and use a whisk. Nice creamy result. Blender is best. 3. 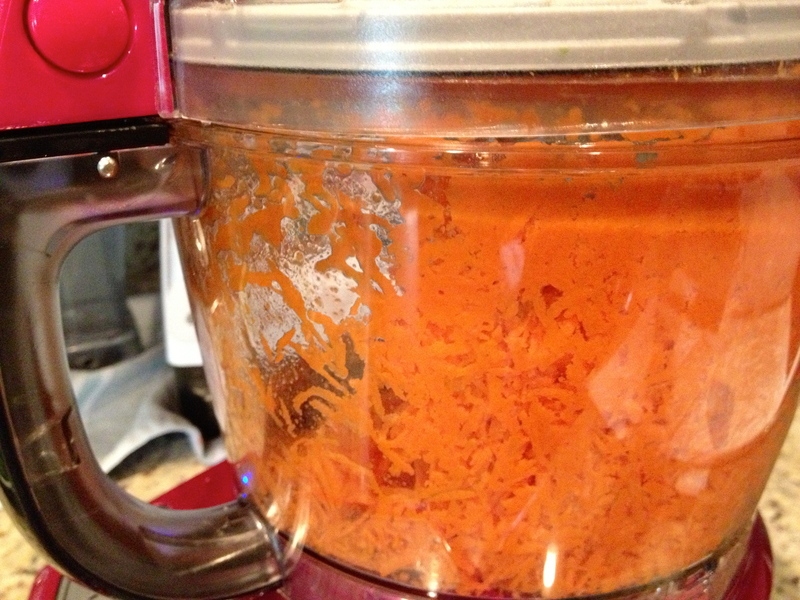 Use your food processor’s shredding blade to grate those carrots. Really not hard. But you can save time by buying pre-shredded carrots. 4. Distribute the greens equally on the plates. 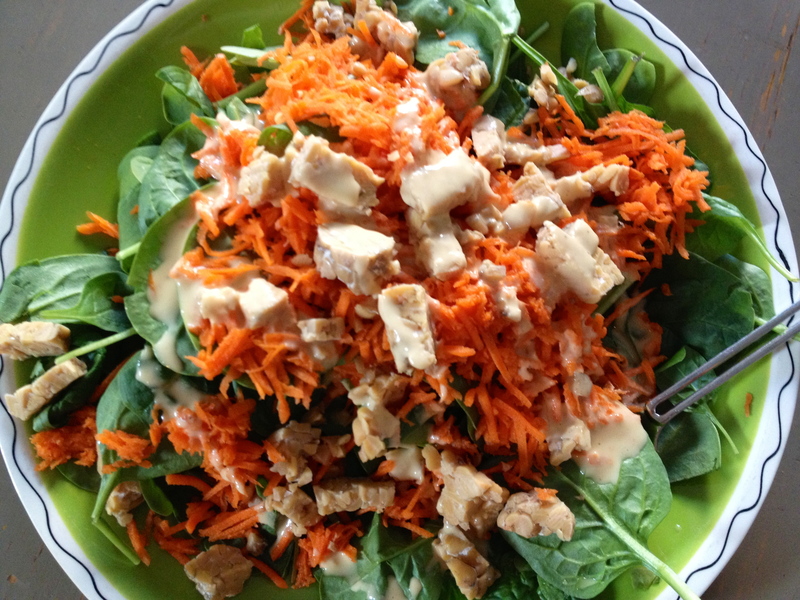 Sprinkle carrots evenly over your greens. Add your tempeh. Drizzle with your dressing. What the heck is tempeh?? Tempeh is a pretty fantastic protein source. For all. Not just us lone vegetarians. Put simply, tempeh is just soybeans cooked down and slightly fermented. Do not let the word fermented scare you. The soybeans are usually combined with other grains such as barley or brown rice for a firm and hearty texture. I like it plain, sliced on a salad, but you can marinate it with barbecue sauce and make some pretty tasty sandwiches as well. 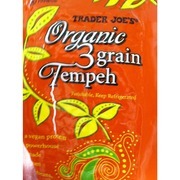 This is what Trader Joe’s tempeh looks like, but there are many others out there. 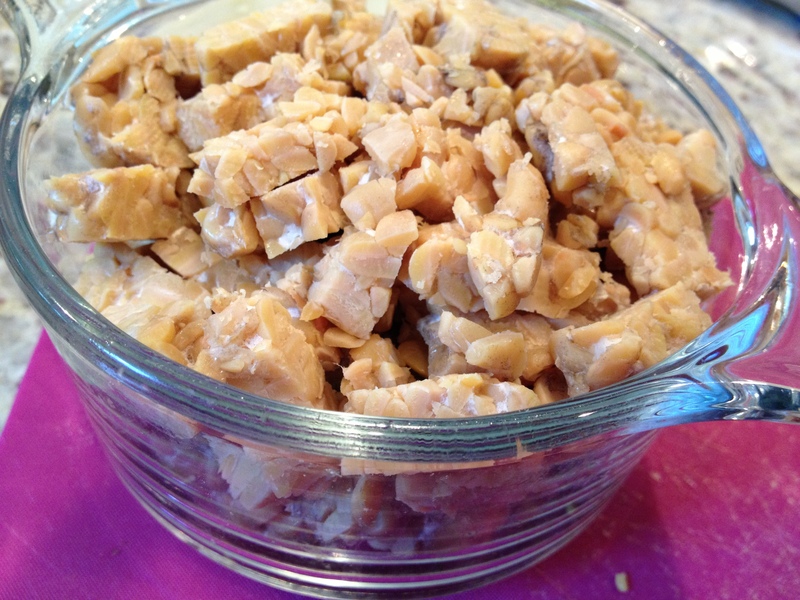 cut it, slice, cube, crumble it, marinate it, pan fry it…..
Where do you find tempeh?? where the tofu, vegetarian meats, dairy free cheeses are at any large grocer. Stop whizzing by that section and take a look! Try this simple swap: Replace tempeh in place of ground beef in your next spaghetti meal. Simply crumble, pan fry for a few minutes, and add to your sauce. Remember: one simple health swap a week can add up to long-term change. I rarely make baked potatoes. I just find them to be kind of boring. Its like thawing frozen peas as a side dish. Too basic. Sorry Mr. Potato. I kind of snooze when I see you. That said, I really should re-visit the baked potato more often. For the simple fact that they are loaded with fiber, potassium and have about half of your daily value requirements for vitamin C. Oh and my daughter loves potatoes. Another reason that I need to start making more baked potatoes and “normal” meals. 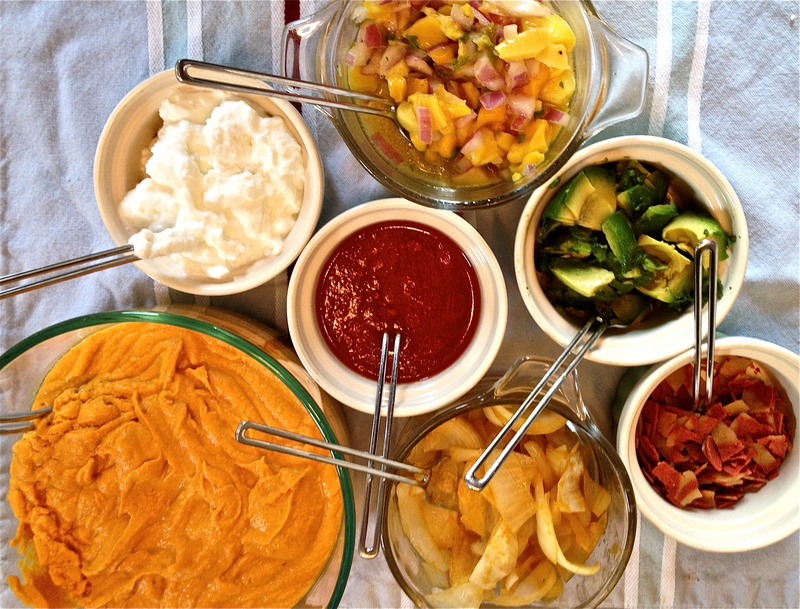 Tonight we will have a baked potato bar that will include a few do-it-yourself toppings. My kids always like to top their own stuff. Taco bar, salad bar. Tonight, baked potato bar. Make your sauce in advance! That way the dinner hour isn’t too crazed. Because really, what potato meal should be too time consuming? Scrub and peel 2-3 potatoes (I say 2-3 potatoes because it depends on the size. 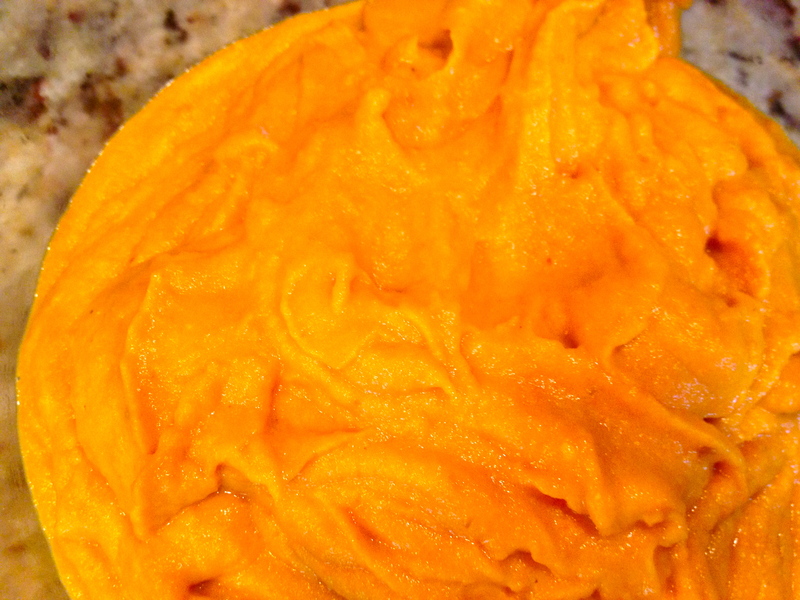 I used 2 small sweet potatoes and 1 medium-sized russet potato). 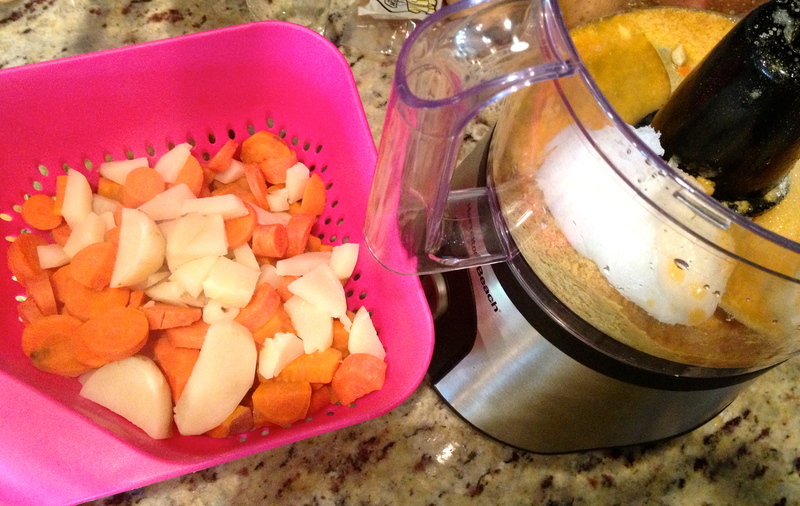 Chop all potatoes and carrots. Add vegetables and remaining ingredients to your food processor bowl. Process until smooth, stopping to scrape down the sides if necessary. We want creamy people! 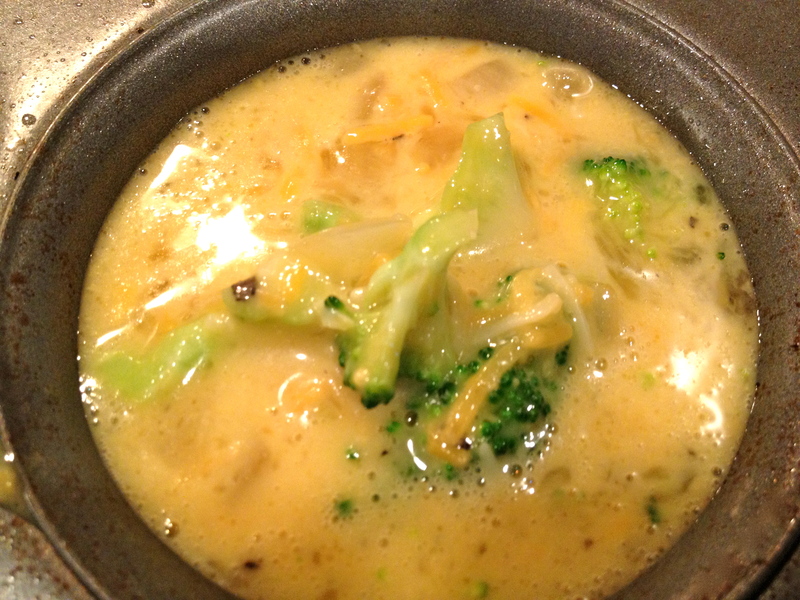 * If need be, add more veggie broth to thin the sauce to consistency you would like. Drained potato and carrot mixture. 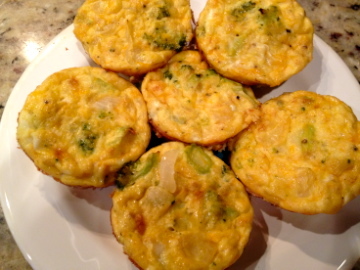 Add those cooked veggies to this concoction. 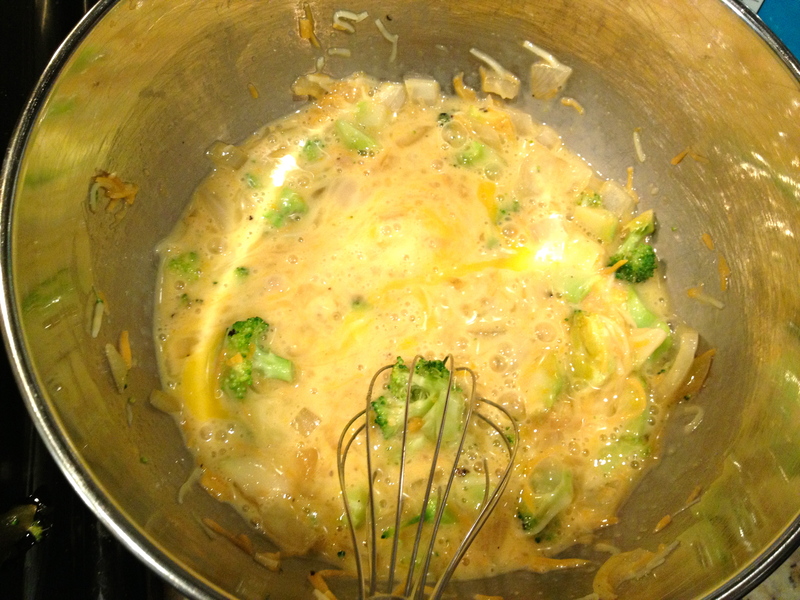 Finished sauce…I like mine kind of thick. 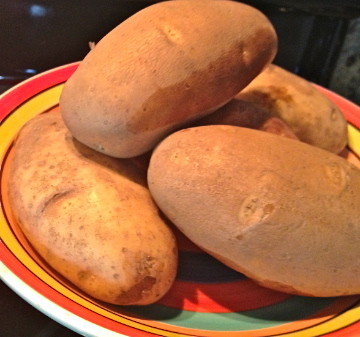 I used russet potatoes and baked them at 400 degrees for about 60 minutes. Again, here are those toppings..
A few traditional toppings, a few not so much. Where is the broccoli and cheese topping you ask?? Too traditional. Maybe next time. 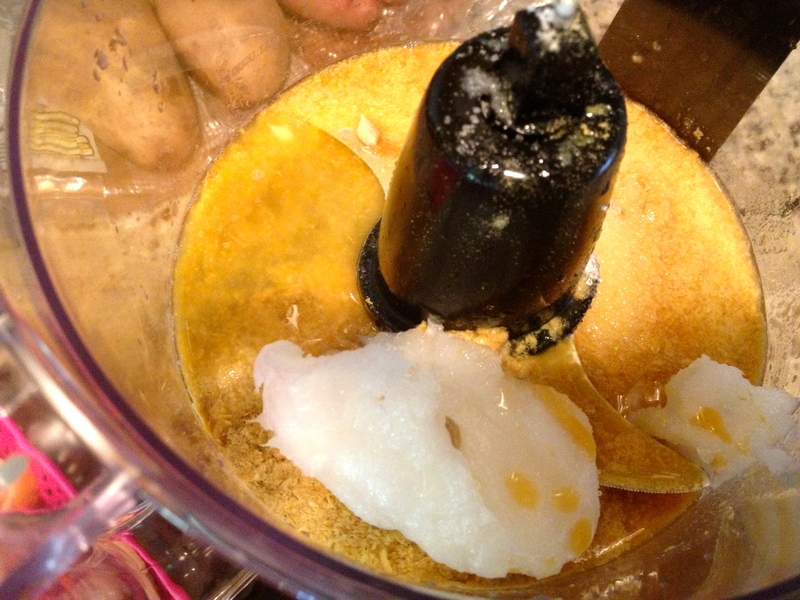 So I bought a tub of coconut flour at Whole Foods oh say maybe, 6 months ago…At least…. This canister has been staring at me for wayyy too long. Finally decided to use it. While I do not follow the paleo diet, I do realize that coconut based diets are the latest health craze. I do say “latest” because science changes so frequently it may be a thing of the past by next week. Anyhow, I do like to experiment with different grains when baking so I figured it was time to open this puppy. 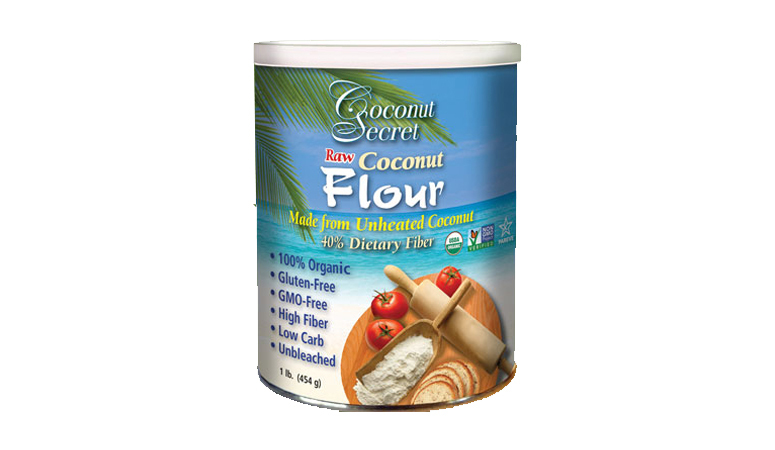 Why coconut flour? Well it is naturally high in fiber and is a fantastic protein source. Who knew ground up coconut meat could be that good for you. One caveat. It can not be subbed 1:1 for other flours when baking. The problem is that it absorbs liquid rapidly and it tends to clump so it is a little more difficult to substitute in other recipes. You have to have some mad kitchen skills (or a lot of money to waste) if you plan to experiment. Although I plan to channel my inner chemist soon, NOT my first time opening the canister. This recipe is straight from google. Found it in several places actually, so I am not sure who to give credit to. Pre-heat oven to 375 degrees and spray a cookie sheet with non-stick spray. 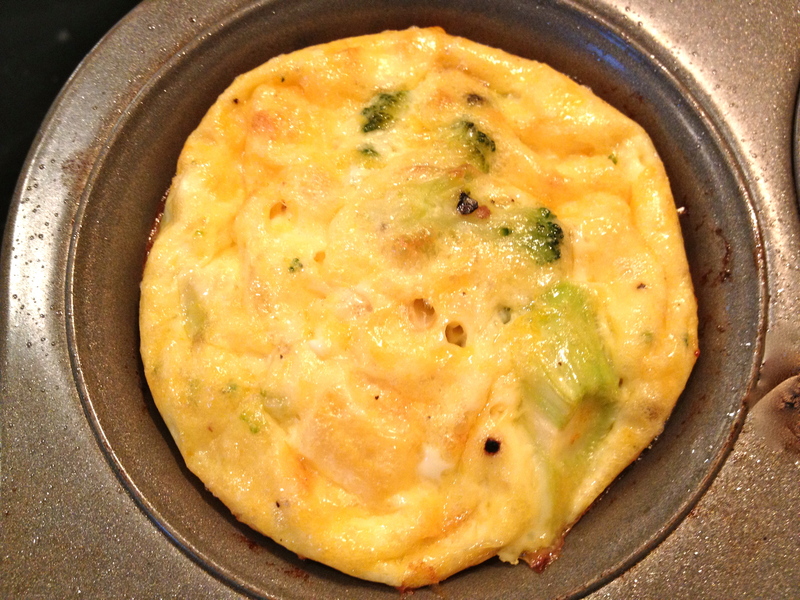 In a medium bowl, whisk together eggs with melted coconut oil, sugar, coconut milk, vanilla, and salt. 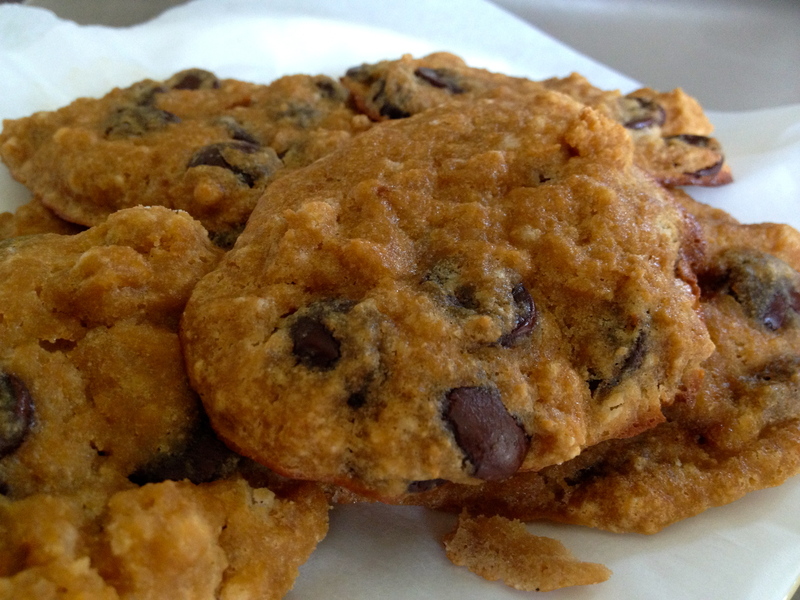 Using a rubber spatula, stir in coconut flour and chocolate chips. Scoop cookies by the teaspoonful and spoon onto baking sheets. 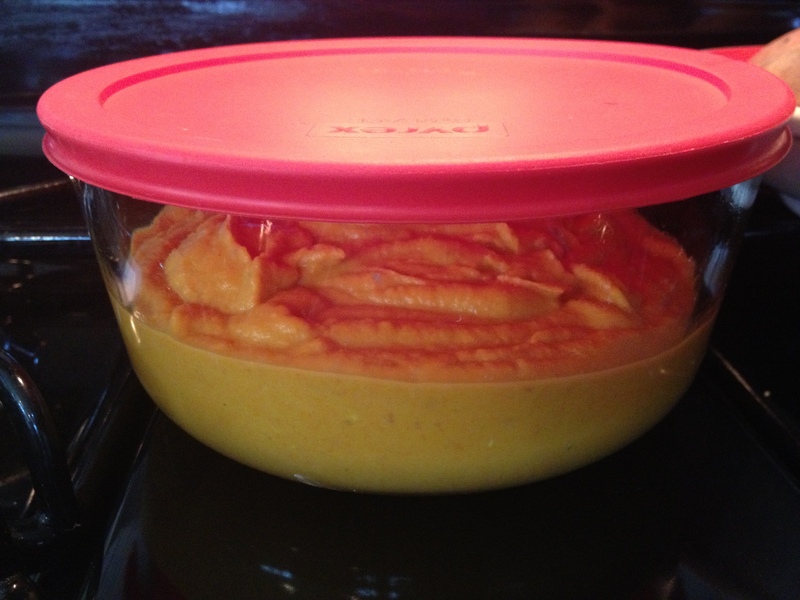 Bake for 13-18 minutes or until browned. 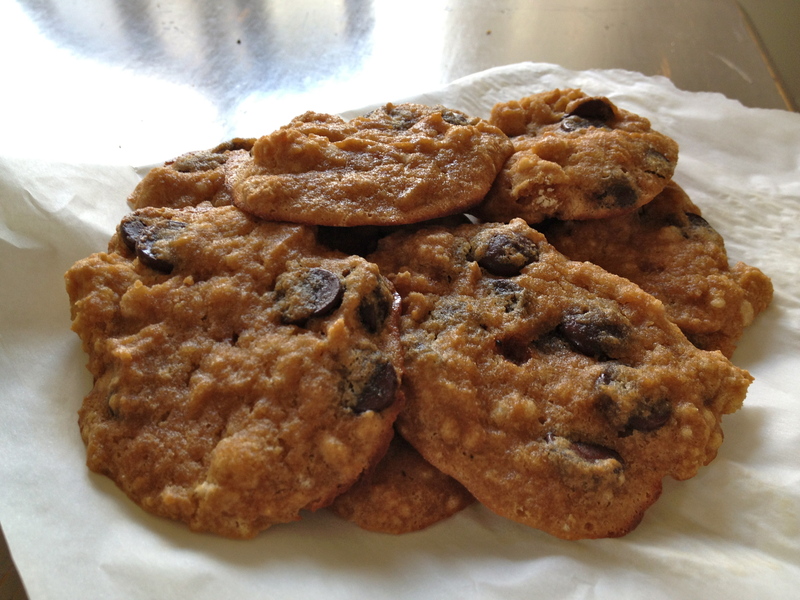 Let cookies cool for a couple of minutes before setting on a cooling rack. Finished product. Chewier than a traditional cookie, but definitely tasty. 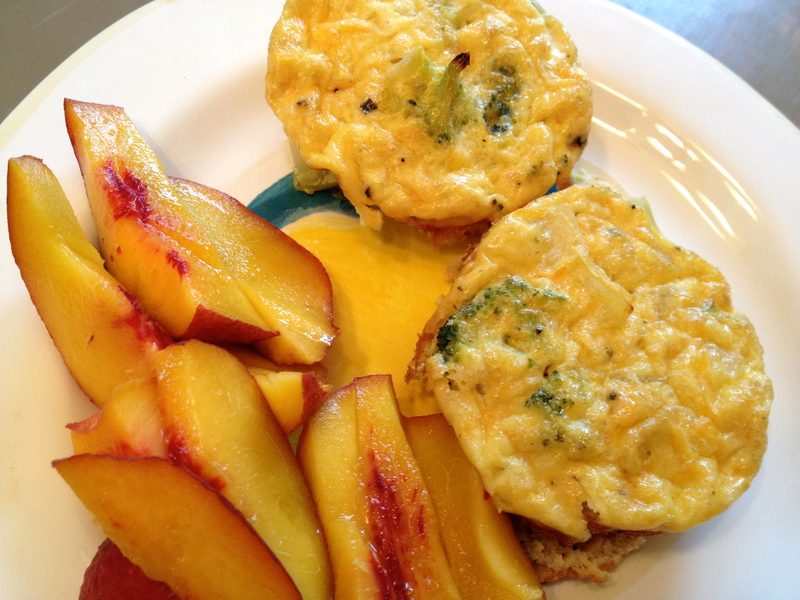 Any favorite coconut flour recipes out there? Any good advice on substitutions? Let’s here them!